I'm a bit confused looking around, this number doesn't seem to make sense, but this is what I have. I believe this is BM 479639, but not sure if there is a letter in front of the BM or not. This has a Block casting of 3836848. This is evidently the higher compression engine from what I have read, with pressure lubrication. Can anyone help me identify what year this engine was built? Also what it was originally shipped in? Make sure you get your casting numbers from the right side of the block below the push rod cover[s]. Some of these may be concealed by the starter. As far as the number on the boss that you photographed, it looks to me as though this may have been applied after some grinding was done on that boss. That said, I would say that all bets are off as far as using that particular number. Try to find the cast-in numbers as specified above and share those. I think I understand what I have now, although the engine serial number doesn't make 100% sense, I'm told this could have happened in the factory. My block is a '53, the casting date on the block is K 30 3 (however that is split-up), November 30, 1953. The strange thing is the serial number on the flat behind the distributor turns out to be a '52, it's JBM 479689. The block is a 3835911, which is the same as used in the Corvette from '53-'55 ('55 offered both 235 6 and 265 v8). Although I should add, the Corvette engine would have a different cam, I'm not sure what is in mine so I don't believe this is the Corvette block. Interesting that my block was built at the end of '53. My block came from a truck as it's a JBM which is right for a truck. Odd thing is it HAS to be from late '53 as that is when the bolt pattern changed. If it was a KBM everything would make sense...but J is for '52. Here's what I got when I took a wire wheel to it. 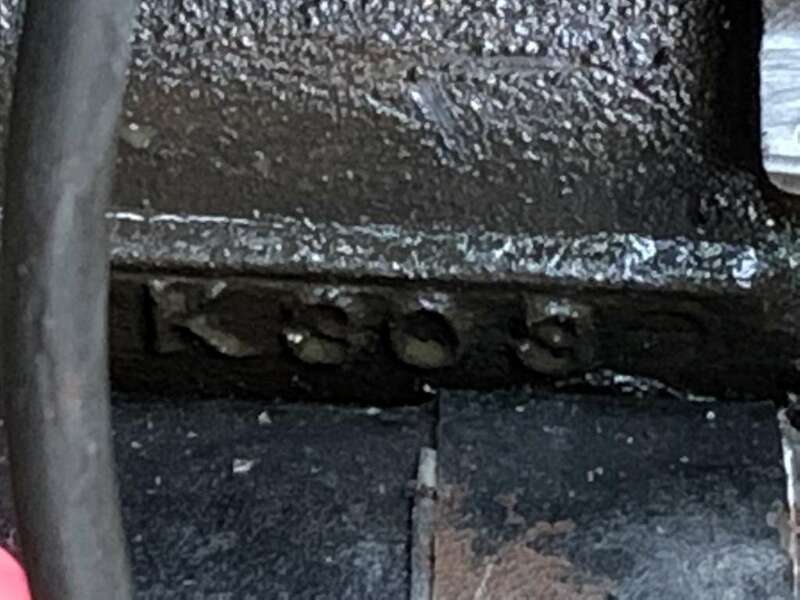 I will note that the J looks odd to me, as if it were a different font, so I don't know the full story on this, although K 30 3 makes sense for the 3835911 block. I've been told this could have happened as GM would cast the blocks in batches and would just rotate them around when they manufactured the vehicles. Not sure how correct that is, but it seems plausible. The block could have been sitting in the back room and used for the new bolt pattern possibly. The head is a 3836848, so the head is a '55-'62 with higher compression and pressure lubrication. Block and head are different years, but the later '53 block is an 18 bolt block, which is needed for the '55-'62 3836848 head. Now there is something that would be very interesting. That is if I open the valve cover and see that the head is dated for '53, which would be very odd as the 3836848 head was used from '55-'62, but my guess is that the engine was pieced together and the date will be between '55-'62 between the valves. I'm guessing your truck is a 3100. In any event, according to my 1951 Chevrolet paperwork I have and I can scan it if you like, a JBM prefix would indicate a 1951 216 engine for use in a 3100 truck. Assembled in Tonawanda, NY. Bare with me here. Here is my theory. A owner of a 1951 truck that had a 216 in it [maybe the truck you own] experienced either a blown or tired engine and decided to up grade to a 1953 235 - your block. But because in many states vehicles were titled with engine serial numbers, to keep everything on the up and up, the 1953 number which would have begun with an "L" was ground away and the old 1951 number was stamped in it's place...thus making the title and the vehicle engine serial number jive. I see that a casting number of 3835911 indicates a 1953-55 235 engine. I'm guessing your truck is a 3100. In any event, according to my 1951 Chevrolet paperwork I have and I can scan it if you like, a JBM prefix would indicate a 1951 216 engine for use in a 3100 truck. Assembled in Tonawanda, NY. Yes, I agree. Although I know the engine was replaced by the 2nd owner, so the engine serial wouldn't have anything to do with my truck. My truck is a 1946 AK Series 1/2 ton pickup. It would have definitely had a 216 in it, but this was the engine that replaced it. This was not the original engine in this pickup. FWIW, my VIN is 14DPF2135, so the vehicle was built in Baltimore, in June of 1946. Here is my theory. A owner of a 1951 truck that had a 216 in it [maybe the truck you own] experienced either a blown or tired engine and decided to up grade to a 1953 235 - your block. Maybe, but I don't see it highly likely. From what I can tell the 2nd owner knew a thing or two about the inline 6, and it's no coincidence that the block/head would be from different years. The head is a very desirable 3836848 head that is known to have high compression. I see that a casting number of 3835911 indicates a 1953-55 235 engine. Yes, and I will add this to it. In late '53 these blocks were known to be used on the original Corvette. They seem to have been used in trucks also, but that seems less clear. I think think the 2nd owner was smart enough to have figured that out, and I don't think it's coincidence that the block and head are together even if from different years. The block is an 18 bolt, so it must be '53 or newer. Maybe you're just saying that the reason the serial is different than the block casting is because that...and that could be plausible. Either it was somehow pieced together at the factory, and it could have been for r&d, I don't know...but either that or the head and block were put together intentionally from different engines as the 2nd owner knew that each were known to be two of the best in breed. One other thing that will be interesting is when I can pull the valve cover. The date for the head may or may not provide more information on the head/block combination. The 3836848 head was only known to be used from '55-'62. It is noted as being a high compression head. Would be interesting if it has a late '53 date on it. I don't know if that could be possible or not. I'm of the belief that your particular 235 has had a far less glorious past. But hey, it's nice to dream huh? Have fun with your '46. I don't see it as that glorious, other than the same block was used on the Corvette, I think the question is if it has a truck or other cam inside of it. I think the chances of the block and head coming together from the factory are slim, but I don't find it any less glorious, rather I find it very glorious if the 2nd owner knew enough about Stovebolts to put it all together. It does fire right up, I'll give it that. The original factory engine number has been ground off and some one restamped a fake number. Your socalled date could mean the engine was a replacement cast in 1963. A 1953 Corvette did not have a special blockThe high lift cam used in the 6 cylinder Corvettes was also use in 1956-1957 and 1958 235 trucks with a 235 engine and all trucks with a 261. You must get the casting number that is behind the starter as that is where it is located from 1955 and up. That is the K303 number. I was guessing this is November 30, 1953? This is it. The casting number will be seven raised numbers and the first number will be a 7. I would GUESS the number will be 3738476 which covers most 1959-1962 235 engines or 3739716 or 3738307. I believe my block casting is 3835911, as noted above. This is noted as being a high compression engine from the last part of '53. The K303 seems to align with that, if K is for November, 30th day, in 1953. That would seem to align with the 3835911 casting, wouldn't it? The only thing that doesn't make sense is the JBM serial number, but if it has been changed, then the other casting markings seem to make sense and what I have is a late '53 block with a '55-'62 head. The block has nothing to do with the compression ratio. The CR is determined by the head. Your 848 head was used from 1956-1962 and the CR was 8.00 to 1 in 1956 and 1957. 8.25 t0 1 from 1958-1962. The same casting was used (848) but more material milled off the gasket surfacce. It it is a block made in 1953 or 1954 it will have a boss on each siied for the motor mount brackets. The boss will have four bolt holes and is about in the center going from front to rear. A 1955-1957 block nothing, a 1958-1962 boss for motor mount three holes. Don't listen aout all this stuff about Cherolet used engines laying around in a c back room, etc....this did not happen. 3835911 is the casting number for a 1954 passenger car Power Glide engine with a 7.5 to 1 C.R. Typing on phone, power went out, FYI. It doesn’t really matter where the parts exactly came from, my pickup is a mutt. What is assuring is the fact that whoever put the engine in seemed to know a bit about the Inline 6 to put it together to begin with. The 848 head came out in 1956. After that the previous 235 heads were discontinued and thr 848 was sold as a new replacement for 1953, 1954, and 1955 engines. The only change on the 848 head is that the casting was changed slightly where the temperatur senser screwed in. This is because the 1956 used an eletrical sensor. A special fittting was then sold so the old bulb and tube unit could be fitted to the head. Sorry to be slow to reply, had missed this. Seems pretty good odds the block and head must be from different engines. I was only trying to figure out if the dates overlapped somehow, since the block appears to be from '53, maybe the parts could have overlapped somehow in the factory. You are giving me the facts, so need to listen to you better. The engine seems to run pretty strong. In fact, I consider that to be one of the pluses on my pickup. I still have a fair amount of things to do in order for it to ride "nicer", and I use "nicer" knowing you are fully aware of the quirks of the pre-AD trucks. Some is probably not related to the engine but other drive train and/or suspension issues, but I am intent to get the 'ol '46 running as smoothly and quietly as possible. There is no insulation on the firewall or side panels in the cab, so pretty noisy, as you know. A fair amount of air comes through the firewall into the cab also...so while the engine is sound, there are things that still need to be done to soften the air and/or noise coming from the engine. No fault of the engine itself! My current plan is to use the NORS torque tube bush I got from you for the torque tube, but will need to assess the parts after I get everything apart. Providing the shaft is not too worn my plan is to replace with what I got from you. If there is wear I'll probably just get an oakie bush. While this does not effect the engine itself, the torque tube bush could make a difference in how the truck feels while driving. All that said, I'll be glad when winter is moved on so the yard I keep my pickup at is a bit 'drier'.